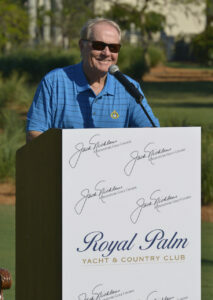 The Jack Nicklaus Signature Golf Course at Royal Palm Yacht & Country Club debuted its latest Golden Bear-led renovations on Nov. 11 at a ribbon-cutting event in Boca Raton, Florida. After touring the course with his design team, Nicklaus participated in a member presentation and Q&A and delighted the crowd with a ceremonial tee shot. It wasn’t the first time that the leadership and members at Royal Palm Yacht & Country Club welcomed the lauded course designer to their club—located only 40 miles south of the Nicklaus family home in North Palm Beach. The Golden Bear first played the course in 1961 as a 21-year-old amateur, and then returned more than a decade ago to redesign the original Robert Trent Jones Sr. design. Royal Palm reopened in 2003 as a Nicklaus Signature Golf Course. Nicklaus continues to add exciting chapters to the club’s storied 55-year history. In the late 1990s, Royal Palm Yacht & Country Club was losing 30 to 40 golf members annually, mostly due to their high average member age of 75—until they enlisted the design services of the Golden Bear. It was also called one of the most significant success stories in the club industry and a shining example of the impact of the Nicklaus brand and design touch. The latest changes, which got underway in 2013, include installation of Celebration grass on the tees, fairways, rough and green surrounds, and re-grassing the greens with Tiff-Eagle. Nicklaus also reshaped and reconstructed the bunkers, reduced and eliminated some waste bunkers, and modified some of the greens. The recent modifications ensure that the course remains a world-class experience for golfers of any level. “A good golf course just became even better,” Nicklaus said when unveiling his latest renovation work at Royal Palm Yacht & Country Club. For more information on the Boca Raton, Fla. course, visit rpycc.org.